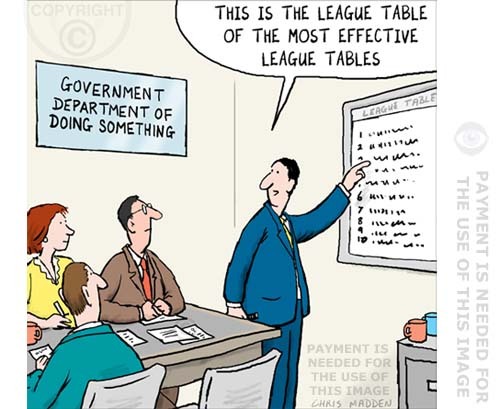 A cartoon about society’s obsession with league tables. 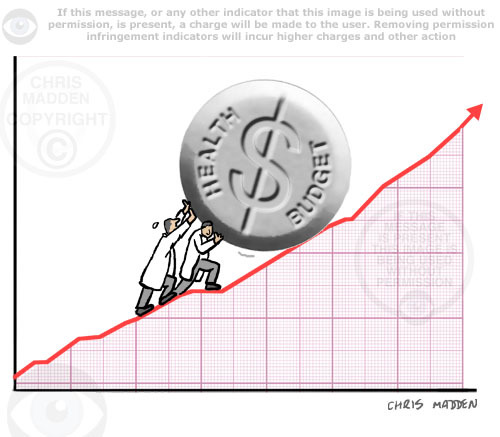 A cartoon about media driven hysteria over health issues. 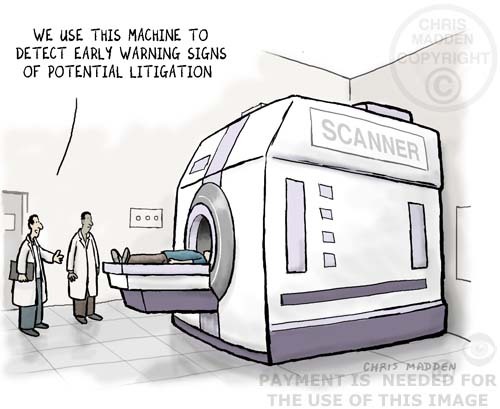 A cartoon about litigation culture, lawsuits against health services, doctors, hospitals. 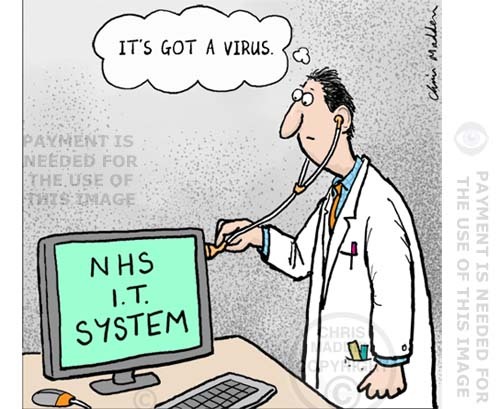 Illustration: the NHS (National Health Service) in Britain spent a fortune on a hi-tech computer system to store and retrieve its medical records. 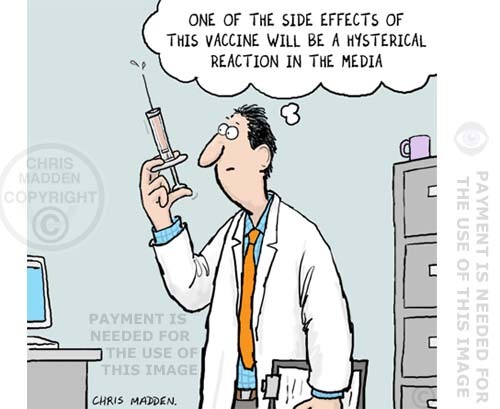 The cartoon is about the way that the press or media report the spread of the illness. 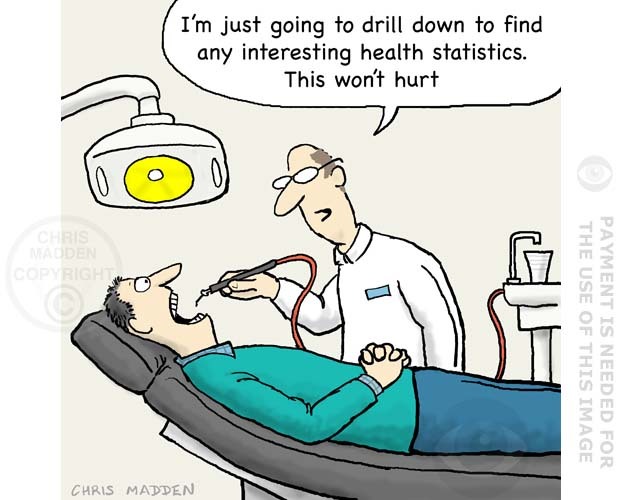 The press has a tendency to distort statistics and to inflate risks for the sake of a good story, so it’s sometimes hard to know what the real risks from epidemics such as the norovirus (or bird flu, etc) really are. Cartoon showing someone having their eyes tested at an opticians. A cartoon about the way that for deaf people or people with hearing difficulties it can be hard to hear what other people are saying, especially in social situations where several people are talking at once or where there’s a lot of background noise. A cartoon about hearing impairment, impaired hearing, hearing aids, social disadvantage. 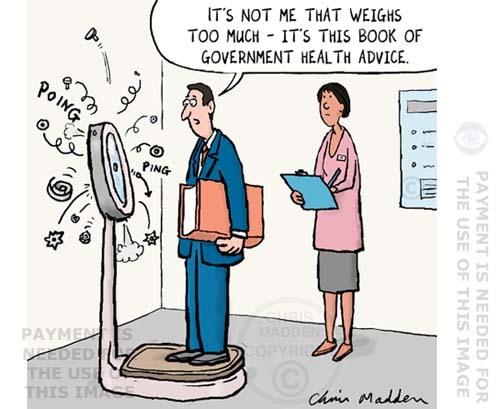 Health spending increasing – cartoon. 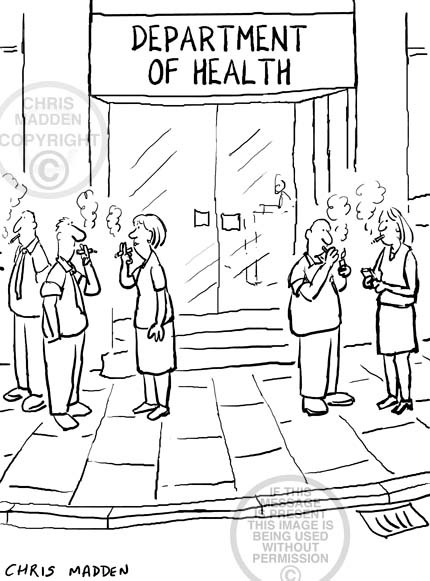 The comic suggests that a way to reduce the impact of an aging population is to encourage people to smoke more cigarettes, thus reducing the number of people who live to an old age. The joke is that while these campaigns are normally about trying to improve people’s health, such as by campaigning to stop them smoking, the one depicted here is to encourage a method of shortening people’s lives by taking up smoking. 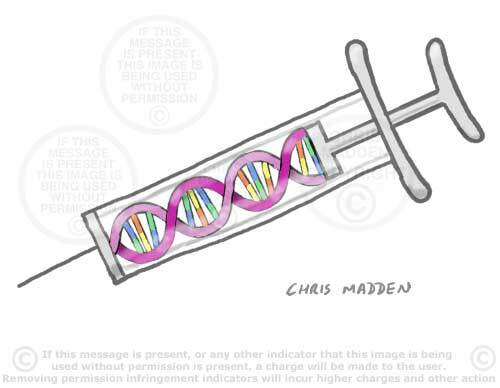 Gene doping cartoon or illustration. Will gene doping occur in the 2012 Olympics? 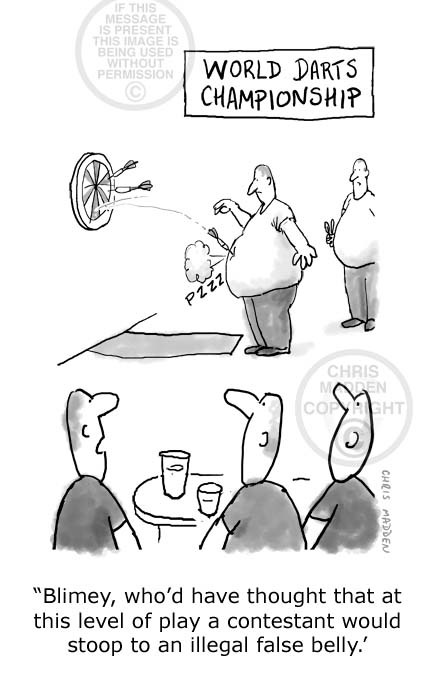 A cartoon about gene doping in sport, Olympics gene doping. Genetic manipulation in competitive sport. Gene doping is defined by the World Anti-Doping Agency (WADA) as the non-therapeutic use of cells, genes, or genetic elements to improve athletic performance. Gene manipulation for muscle enhancement in athletics and other sport has bioethical implications similar to those involved in chemical doping and other methods of gaining an unfair advantage over sporting competitors. Genetic manipulation in athletics and other sport may include ways of increasing muscle growth, altering blood characteristics, increasing endurance, enhancing oxygen dispersal and reducing pain perception. Showing gardeners in a garden seeing the first swallow of summer and hearing the first hay fever sneeze at the same time. Traditionally it’s the sound of the first cuckoo that heralds the summer, however cuckoos are now becoming rarer. Meanwhile, hay fever is becoming more common, so the sound of a hay fever sneeze is replacing the call of the cuckoo as the harbinger of summer. A cartoon showing a doctor in the garden of a hospital. He has noticed that one plant looks sickly, so he’s put it on a drip. A cartoon about ways of supplying nutrients to garden plants. Drip mechanisms are a common method of irrigating crops or of watering garden plants, so the drip joke isn’t actually very far fetched. 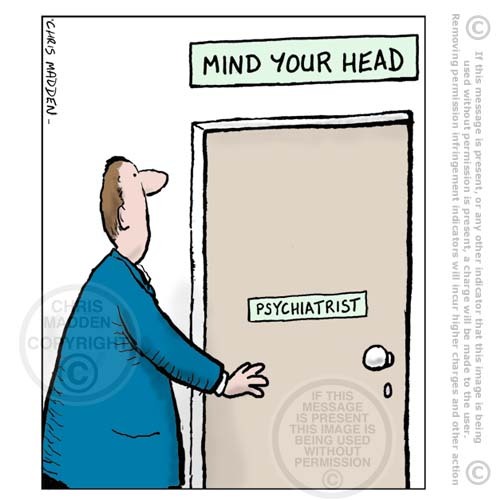 Cartoon about the sometimes unnecessary use of therapy and psychiatry. This isn’t a criticism of all therapy and psychiatry by the way, despite appearances. It’s more a questioning of some of the characteristics of some of the practices – their philosophies, policies, politics and so on. 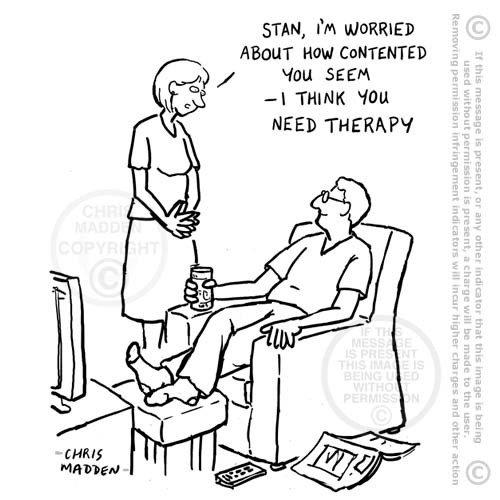 A cartoon about counselling, therapy, psychiatrists. Cartoon about death and the grim reaper. Cartoon about death and the grim reaper. 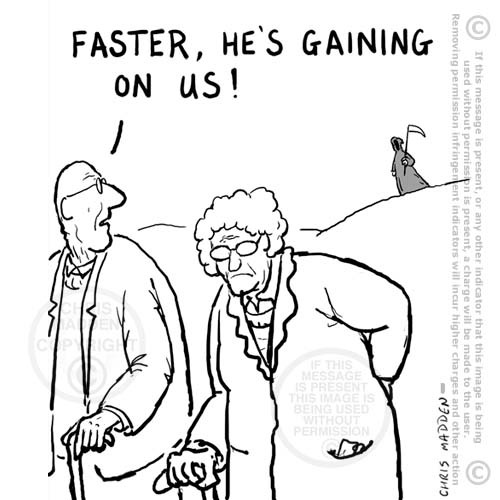 The grim reaper approaching some people who are trying to avoid him – but they are getting older and slower and won’t be able to outrun him for long. A cartoon about mortality, death, time running out, intimations of mortality, old age. 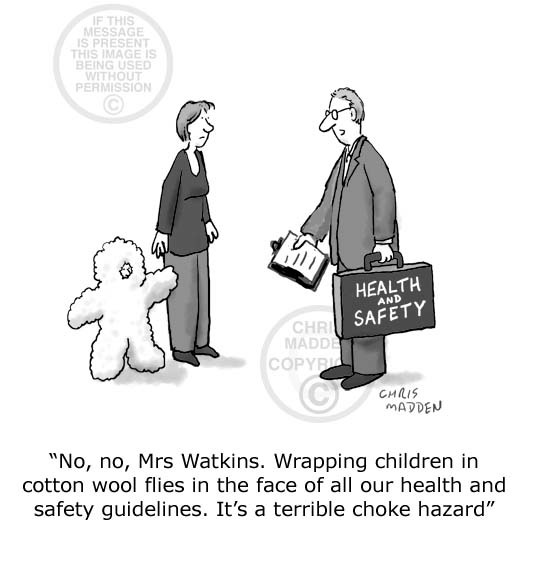 An anti smoking cartoon that parodies cigarette advertising. This is an anti-smoking cartoon parody of a cigarette advertising campaign for John Player Special cigarettes in the early 1980s. The cigarette packets were black, and the advertising campaign relied on a number of visual puns and word plays on the word black (using the similarity between the words ‘black’ and ‘back’) – word plays such as “Black chat” (with a photo of two packs of cigarettes looking as though they were talking to each other) and “Flash black” (with a photograph of a cigarette packet surrounded by flashes of lightning). My parody or spoof advert used similar plays on the word black, but giving it a negative spin such as by using the term “Black death” (with a skull made out of cigarette packets), “Black to the land” (i.e. 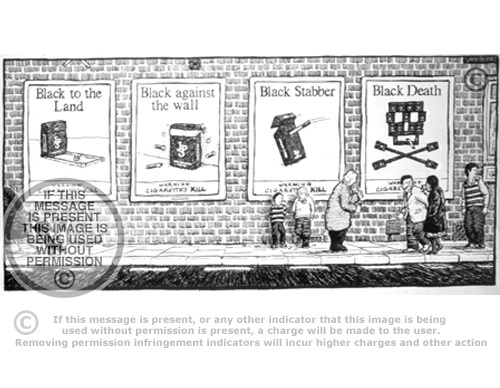 being in a grave, with a cigarette packet as a gravestone) “Blackstabber” (being stabbed in the back with a cigarette) and “Black against the wall” (being against a wall with a firing squad – the bullets being cigarettes). This is an anti smoking cartoon or illustration that was drawn when cigarettes were still advertised on bill boards or advertising hoardings in Britain. 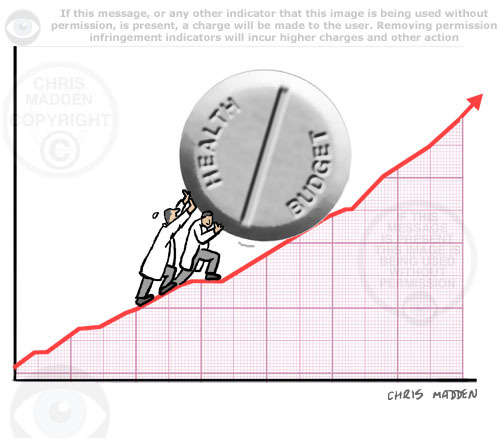 An extra touch in the illustration is the figure who is walking out of the cartoon to the left. It is a figure who is wheeling a shopping basket in the form of a John Player Special cigarette packet. The hand clutching the basket is a skeleton, because the figure is death. A cartoon about anger management therapy. 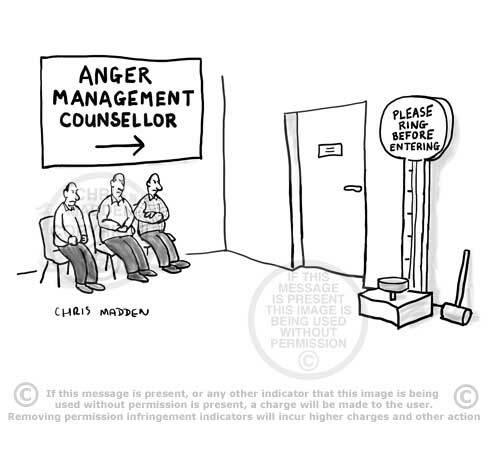 Cartoon about anger management therapy. Cartoon showing a group of patients waiting in the waiting room outside an anger management counsellor’s consulting room. There is a bell outside the consulting room, with a notice on it saying “Please ring before entering”. The bell is on a fair ground “ring the bell with a hammer” apparatus. Caption: “If you smoke you’re less likely to die of an age-related illness”. 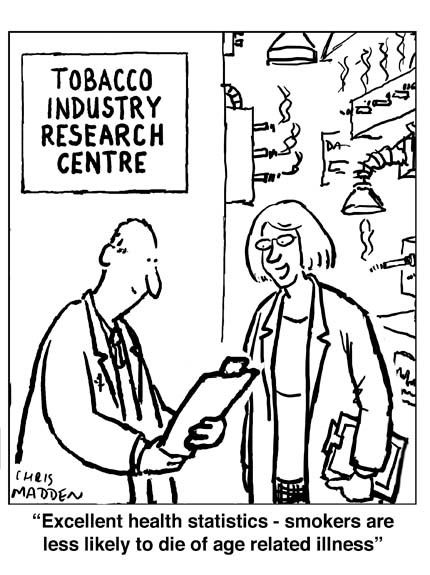 A cartoon showing a research laboratory doing medical research into the medical and health related effects of smoking cigarettes. The rerearch laboratory belongs to an organisation called “The Tobacco Industry Research Centre”, indicating that it’s sponsored by the tobacco industry. The results of the research are given a positive spin by announcing that they show that statistically cigarette smokers are less likely to die of age-related illnesses. 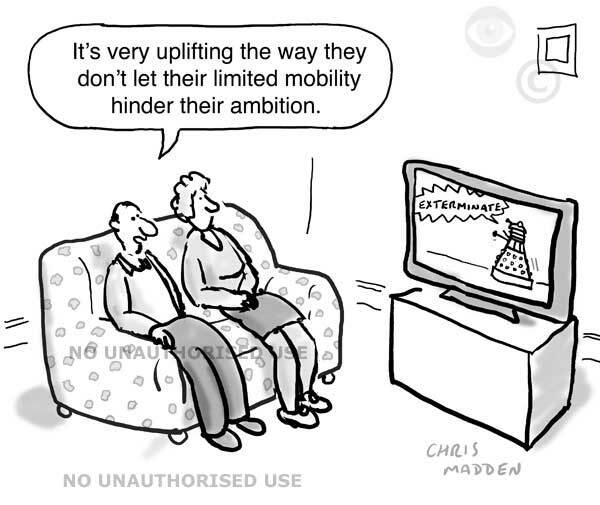 Dyslexia Cartoon. 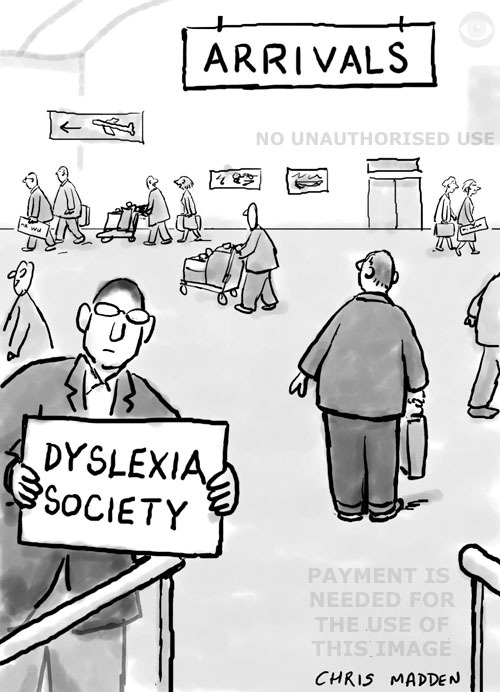 This cartoon shows a dyslexic person arriving at an airport and not being able to read the notice that’s held by the man who’s there to meet him. Psychology illustrations. The mind set of an optimist. 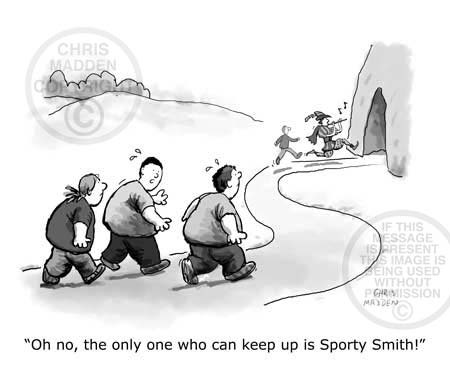 Psychology cartoons – a cartoon showing how optimism works. 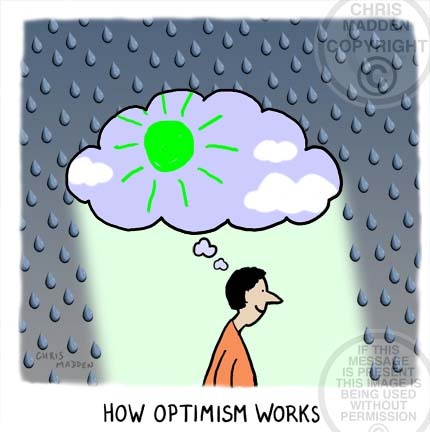 Showing a person thinking optimistic thoughts that are acting like an umbrella to keep rain off. 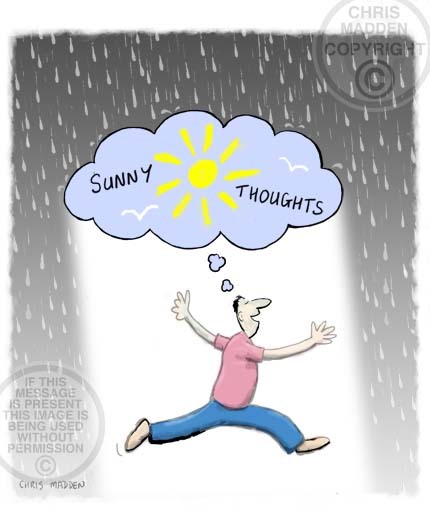 Psychology cartoon about mental states, mindsets, positive thoughts, positive thought processes, happiness, glass half full, how to be happy, positive energy, cheery, therapy, cbt, cognitive behavioural therapy, smile, incurable optimist, projection. See also the accompanying illustration about pessimism. Psychology illustration. The mind set of a pessimist. 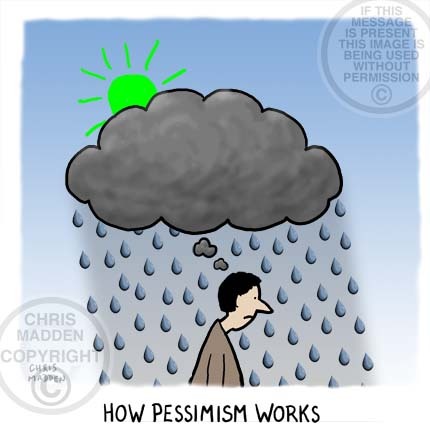 Psychology Cartoon – a cartoon showing how pessimism works. A person outside on a sunny day. 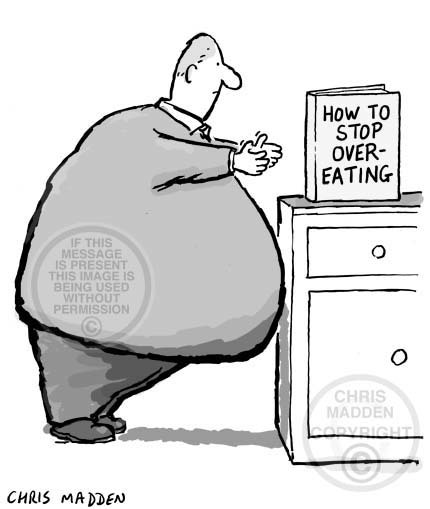 A thought bubble from the person is hovering over the person’s head. It takes the form of a dark cloud with rain pouring from it. Psychology cartoon about mental states, mindsets, negative thoughts, negative thought processes, happiness, sadness, depression, how to be happy, therapy, cbt, cognitive behavioural therapy, glass half empty, projection, glum person, gloomy thoughts. See also the accompanying illustration about optimism. 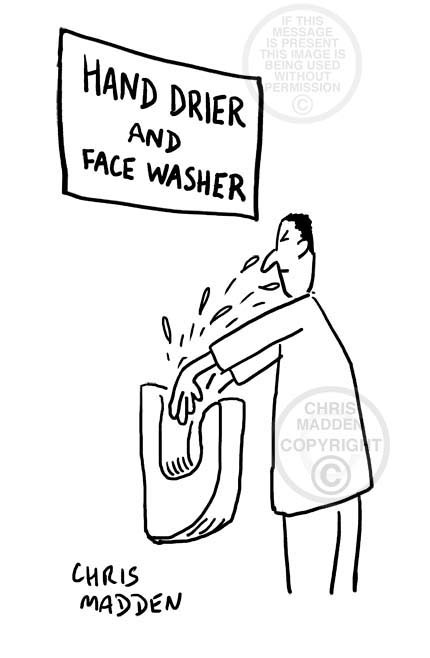 A cartoon showing a model of hot air hand drier splashing the user’s face with water due to a design flaw of the drier. Hand driers of this type were first introduced by the Dyson company (I think), who pride themselves on their innovations in design. Other companies also make similar hand driers, possibly in imitation.